Chandigarh has always been one of the cities where people have dreamed of staying in. The wide open roads and the fact that the city is very organized makes it a great city to live in. 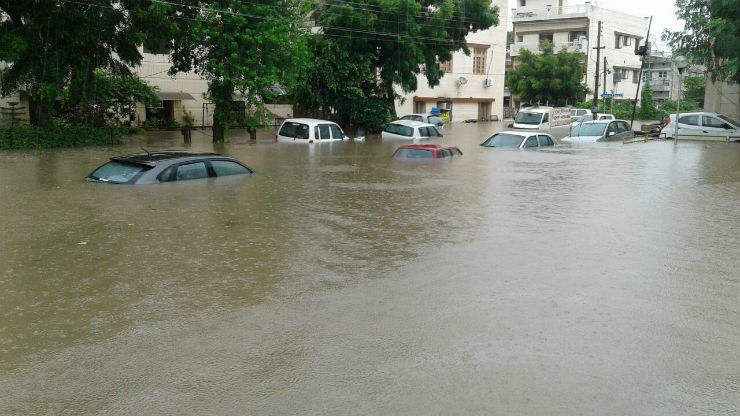 However, things turned very sour in the tri-city (Chandigarh, Mohali, Panchkula) area yesterday when heavy rains lashed the region. The meteorological department said that there was 112 mm of rain that was recorded between 8.30 and 11.30 am and this led to massive water logging, due to the poor drainage systems. Wondering what a car site is doing talking about rainfall? Well, the rain led to so much water logging that a lot of cars got submerged. People had to leave their vehicles and get off as the levels were very high. A video below shows how bad the situation was. You can also see a few cars floating away as the bus made its way. So what do you do in such a case? If you are travelling when it starts to rain heavily, be aware of the water levels. If you are stuck and you see the levels rising make sure to keep the engine revved so that water doesn’t enter through the tail pipe and cause the vehicle to shut. If the level is rising a lot more, like you can see in the video, shut the engine and get out of the car. It is better that the engine isn’t running if the water level is high. In case you are driving and you see the that level is high, turn back if you can. There is no need to venture into the water unless you have to. If you have to, then make sure you shift the vehicle to the lowest gear and keep the engine RPM as high as possible. Keep the momentum going and don’t go too fast. In case your car stalls in water, DO NOT try to start it again. Push the car to an area where water level is low and then try starting. If the water level is what you are seeing in the video above, make sure to get your vehicle towed to the service center. DO NOT attempt to start the vehicle if the water level has gone above the bonnet. Water would have most likely entered the engine and in that case you are better off drying it off completely and making sure all parts are okay before starting. If water enters the engine compartment while the car is driving, the engine will get hydro-statically locked, something which will be an expensive fix. If you are driving an automatic vehicle, try shifting into manual mode or sport mode so that you can control which gear the vehicle is in. Make sure to stick to the lowest possible gear while water wading.